I wanted to share a few items I found on Amazon that are perfectly farmhouse. I don't normally think to shop on Amazon for home decor, but they have some really cute things. Here are some of my favorites that I found. I will take one of each of these please and thank you! 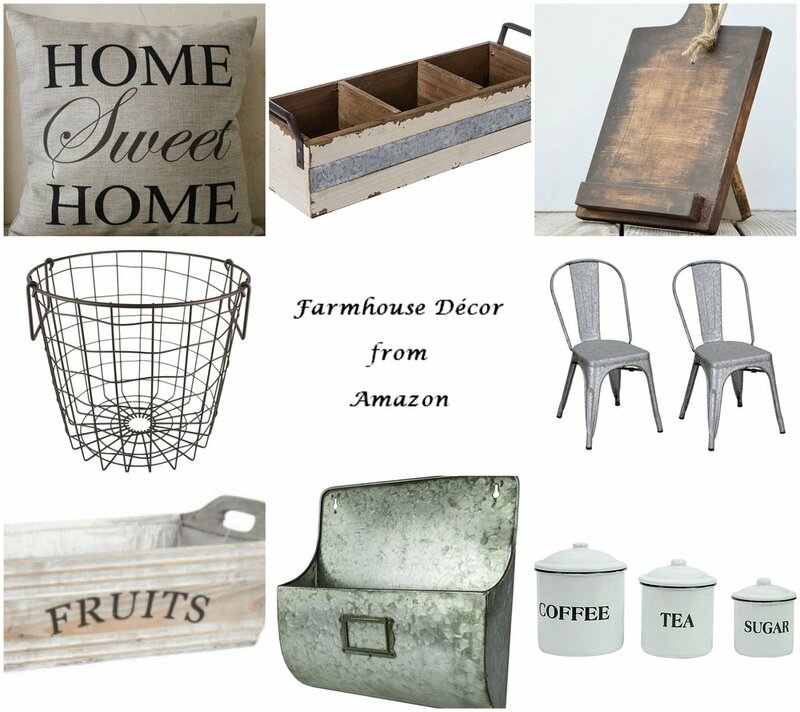 Everything here is farmhouse in style and practical and useful too! I love the wooden ipad holder and I can think of a lot of ways to use that caddy. Desk organizer, silverware or candle holder, just to name a few! The metal basket would be perfect for blankets or extra storage for just about anything. The metal wall organizer would be great for storing mail and I love the simplicity of these canisters. I don't think I need to say much about these metal chairs. They speak for themselves. Love! So, the next time you are on the hunt for some farmhouse decor, check out Amazon. Also, if you are unfamiliar with Amazon Smile, I highly recommend trying it. The only difference between it and Amazon is that you can choose a charity to donate part of your total to. I have mine set up to donate to The Animal Rescue of Tracy, where we found our fur baby, Molly. There are a lot of charities you can choose from and it doesn't cost you anything! What's not to love? I also want to say that this is not an affiliated post, I just really like all of these items. As I said above, I will take one of each please!